The congregation spontaneously applauded at the end of John Hill’s reflection on last Sunday’s readings. It was inspired by National Sorry Day, the annual commemoration (on May 26) of the tens of thousands of Indigenous people who were forcibly removed from their families as children. The Neocat position, as proclaimed by assistant PP Clesio Mendes in his “homily” that day, was clear: there’s no point in saying sorry – just ask for God’s forgiveness. The congregation responded with incredulity; some walked out of the church. Time and time again these men speak and act out of ignorance; a willful ignorance born of a refusal to become informed by reading or dialogue; an ignorance that is inexcusable in clergy appointed to a parish with an involvement and commitment to the Aboriginal people unlike any other; an ignorance that can only be seen as based on deep seated racism and prejudice that seems to be sanctioned by the church hierarchy. This week is Sorry Week. It is an acknowledgement to our Aboriginal brothers and sisters of the misery we have inflicted upon them. We ask for forgiveness. We have so much to be forgiven for. That doesn’t mean that we beat our breasts, wear hair shirts or get into the way of flagellation. Rather we look deep into ourselves as individuals and as a community and see what amends we can make. We apologize to our indigenous brothers and sisters because we have made them suffer from our illusions. There was a time when we pursued them with our idea of truth. We were wrong because we failed to listen and warm to the richness and beauty of a dreamtime culture which contained their truth. They have been able to move through life with the supreme confidence of knowing that they are surrounded by spiritual beings. We erected barriers of logic which prevented us from seeing clearly into our own dreaming. The readings of today show us the way as to what we can do and become. Peter says “God does not have favorites, for one that does what is right is acceptable to him.” He then asks the question as to who is missing from the gathering, who should be here who is not? Peter in his insightful way tells Cornelius to stand up - no prostration, no ring kissing. He showed that The Way was open to all, that Christ’s message was inclusive, that no one had a monopoly of truth and that God’s spirit was open to all. Yet it was precisely here that the dilemma for the early church lay. All the early converts to The Way were Jewish. What then about the others? The death of Stephen, the first martyr, was the catalyst because many so called converts ran for cover and the depth of their Christianity peeled away like a veneer under the midday sun. The intrepid ones, however, found courage and became stronger and preached the Jesus story which was in direct confrontation to Caesar who saw himself as the only ruler. This was welcome news for the oppressed as Jesus had proclaimed a new world order. Peter realized that God’s spirit went well beyond boundaries and this meant that the outsider was blessed. Peter saw that believers cannot refuse to recognize what God was doing, for His spirit comes upon all who are open to receive it. Sorry Week reminds us that exclusivity is still happening in our midst. It has left a divisive legacy. To limit God’s love and presence is to treat others less than ourselves. Unfortunately the history of institutional Christianity is tainted with innocent blood. The pillaging Crusaders are one example. The scandalous way the Aids issue is being dealt with in Africa is another. The way the church has failed to understand the cultural difference and traditions of a people has had far reaching negative effects; the emotional and spiritual fallout is still with us. We know we could create a litany of abuses all protected in the name of supposed truth. Why we are only interested in our own salvation? Peter asked “Is there evidence that God’s spirit is active among peoples on the other side?” The answer is yes. Then we must pull down the barriers and welcome them. St. John’s letter is one of rare beauty for it illustrates the close relationship between mutual love and the love that springs from God. To fully understand this, love must be lived and demonstrated in a justice based on compassion. St. John says “Those who do not love do not know God”. The gospel is the real clincher. It is the most simple and yet the most difficult instruction in the bible. It broadens belonging and who is worthy of love and compassion. Radical love goes well beyond our churches. It flows into the world - living the reality of the Kingdom compels us to seek out the transforming power of God’s justice and his love. To do this we must rid ourselves of fear. John XXIII talks about the law of fear as not being the only law under which we can live. For we know under the law of fear we deal with each other by “the methods of beasts”. This excludes the love John speaks of. Today’s message lets us remember that a profound requirement of our nature is to let love, not fear, reign in our hearts. Once this happens we are made very vulnerable because we know that the hidden power of the gospel is demanding to be seen in and through our poor person, namely ourselves. The cults that have developed in our Catholic religion are scary. As Ted Kennedy said in his book, Who is Worthy, “The true pastor has a sharp eye for discerning where people have been sinned against rather than sinning.” Our church has been let down by some of our religious leaders. The more sin and guilt are emphasised the more dehumanized we become and we move farther away from the real message of the Gospel. The result of this being that we lose the innate joy that is part of our being human. This is apparent in our daily life. We see our federal government callously lock up asylum seeking children, destroy workplace rights, continually lie about Iraq. We see the big companies throw our young people in the prime of life onto the scrap heap because they see outright profit and economic rationalism as the important reality. We cry out for bread and we are given stones. We cry out as a community for the love that Peter and John speak so beautifully about. Why? Because we want to share it with others for we know that it is at the heart of the preaching of the Carpenter of Nazareth. We can’t go past the richness and the beauty of the words of Gerard Manly Hopkins which show with such dignity the Christ message, “The world is charged with the grandeur of God. He will flame out, like shining from shook foil”. That is the inclusivity of love spoken about in today’s readings. God’s beauty is found in the love we share. We pay the price for what we believe, deny or set aside. We cannot be Christians without Christ and the cruelty of doctrine without the poetic grace of love will leave us barren. 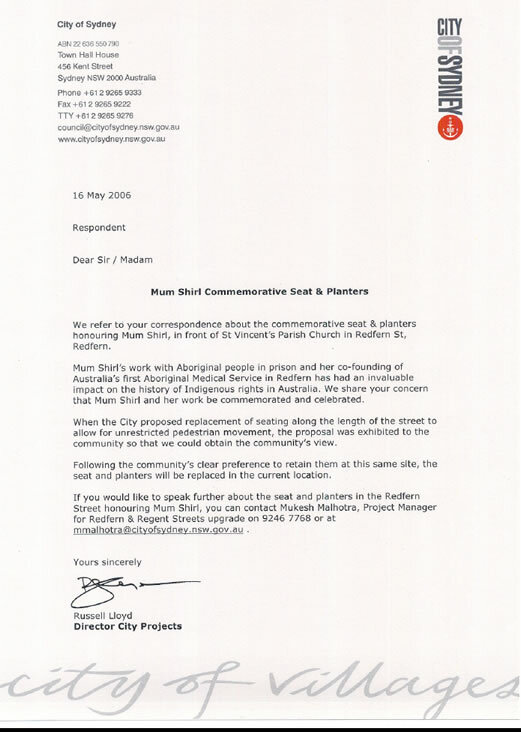 It would appear that Sydney Council plans to remove the Mum Shirl memorial seat from outside the church as part of the Redfern Street Upgrade. It was installed six or seven years ago by the then South Sydney Council. The seat is located in Redfern Street outside the St Vincent's Catholic Church [see picture on Church Mouse home page] where Fr Ted Kennedy was parish priest for 30 years, and next to the Aboriginal Medical Service. It is part of the cultural history of Redfern commemorating Mum Shirl's tireless work for her people. Its location commemorates the long collaboration between Mum Shirl and Ted Kennedy. It is regularly used by Aborigines. Apparently offended by the presence of those using the seat, current parish priest Prindiville requested its removal. Prindiville has alienated local Aborigines who claim he makes them feel "like lepers", and is at odds with the St Vincent's community. Neither group was consulted.